I’m super excited to share this recipe with everyone! It is extremely tasty and can be done in one dish! I used my cast iron skillet, but you could definitely do this in a glass casserole dish. I do not recommend a baking sheet, because it is too shallow. The “crispy” party of the chicken is made from pork rinds. I read somewhere that this is a great alternative to bread crumbs and also gives some extra natural fat! Unfortunately, the pork rinds are NOT Whole 30! However, I did use antibiotic free pork rinds from the Epic brand (Sea Salt & Black Pepper flavor), which can be purchased locally here in Rockport, TX, at Kimmi’s Fine Foods! If you have never checked out Kimmi’s, I highly recommend you go soon! She sales high quality foods, gluten free, organic, antibiotic free, smoothies, and lots of vitamins! Kimmi’s also sales Coconut Aminos, which you will need in this recipe! You can also find this at our local H-E-B in the gluten free section, but it can be hit or miss there. I recommend going to Kimmi’s, because this gives you an excuse to check her place out! Combine the mustard, coconut aminos, olive oil, garlic, sea salt & pepper into a zip lock bag. Once done marinating, preheat the oven to 400°F. 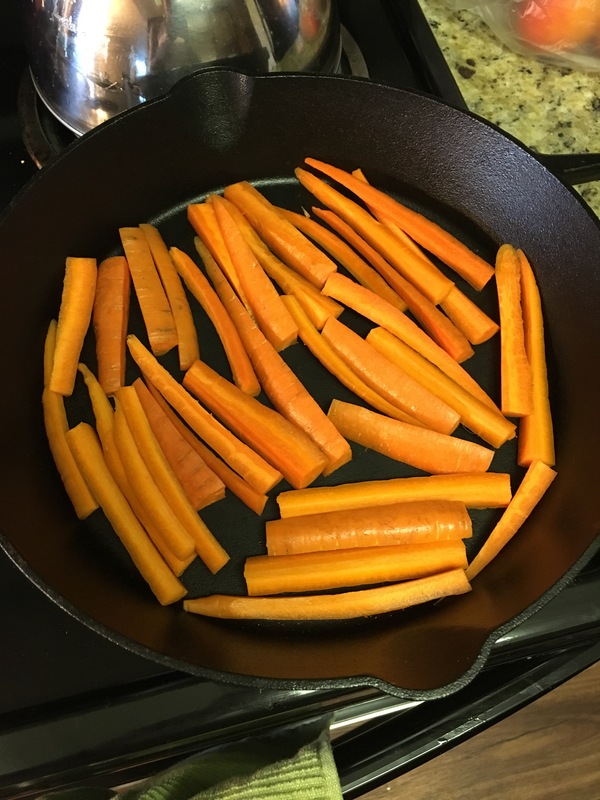 Place the carrots and red onions into the cast iron skillet. In a medium sized mixing bowl, add the pork rinds and thyme and crush the pork rinds. Once they are crushed, evenly mix the thyme. 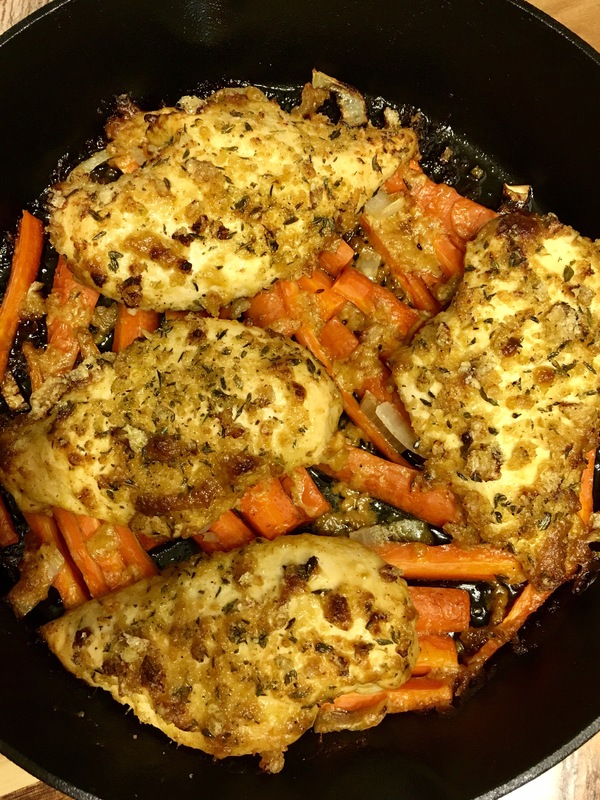 Dip the marinated chicken breasts into the pork rinds mixture on both sides, and place in the cast iron skillet, on top of the veggies. With the left over marinate, I lightly drizzle a little bit of it on any exposed veggies. The carrots will come out with a great mustardy-garlic flavor! Place the dish in the oven and cook for 35 minutes or until the chicken reaches an internal temperature of 165°F. Start checking on the chicken around 30 minutes just to make sure the pork rinds are not burning!